In the the M.A. Art Therapy/Counseling program I find myself reading and/or studying quite a bit. Spending hours on end at home can be wearing. A simple change of location is enough to keep me energized and in the frame of mind to do my best work. 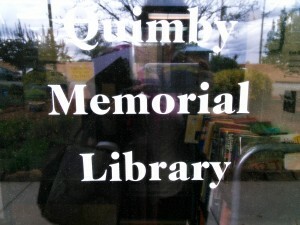 The Quimby Memorial Library located at 3960 San Felipe Road, Santa Fe, NM 87507, on the Southwestern College campus. You won’t find friendlier, more helpful, staff than Lesley and Larry… plus the library is loaded with useful grad school resources. Need to check out a laptop? They’ll hook you up. Want to read a text book for you next class (ordering books online is awesome but they don’t always arrive in time), they got you covered. Need WI-fi? The campus is entirely online. The computer lab is in the back of the library and great place to do research or write a paper (which you can print at the library, for a very small fee). Remember to check with the librarian regarding which eBooks are available each term (I’ve mistakenly bought books that I didn’t need to, books I didn’t want to keep, not realizing how extensive the Quimby Memorial Library resources truly are). 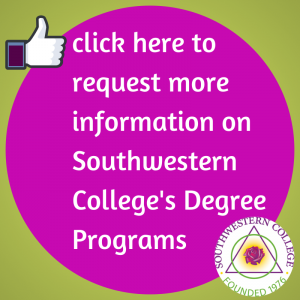 SWC students have access to 20K+ books and media in the in the Southwestern College Library, on-line catalogs in several New Mexico college libraries, and several powerful national databases (EBSCO, Gale, World Share and World Cat). My fave place to sit and study or ready in the Quimby Memorial library is the nifty massage chair (which is seriously underutilized)! The Santa Fe Library, Southside location, at 6599 Jaguar Drive, Santa Fe, NM 87507. Located just a few minutes from campus, the Southside Santa Fe public library is a beautiful and peaceful place to read, research, study, or write papers. A 25,000 square foot library, it has many environmental features including radiant heating, water collection (for irrigation), low VOC paint, passive solar, and carpet tiles made from recycled carpeting. Hurrah for beautiful and green spaces. Art work was incorporated into the building design, including a woven Olla, an art creation by artist Randy Walker, which overhangs the entrance. The library’s high ceilings, plethora of windows, outdoor patios, and peace and quiet, make for a great study location alternative. They have a nice selection of books and other media (and wildly there are no late fees for over-due books in Santa Fe—mind-blowingly awesome, yes?). All Santa Fe library locations are wheelchair accessible and the Southside location has free parking. 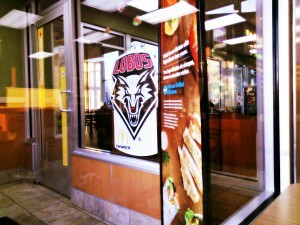 Micky D’s located at 4001 Lucia Ln, Santa Fe, NM 87507 (off of Airport Road). The Golden Arches is super close to campus and has late hours which means you can drop in here after you get out of a 9 o’clock class. 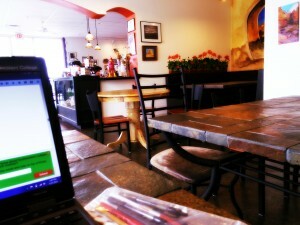 It’s a clean place to study with free wi-fi and uber cheap serve-yourself unlimited iced tea (unsweetened or sweet)! There is a power outlet, too—it’s inside the room where the childrens’ indoor jungle gym is located—so you can keep your devices charged. Can’t tell you how many hours I’ve wiled away, working on a laptop, happily listening to the sound of childrens’ laughter at MacDoh’s. Seriously. Tribes Coffeehouse and Co-Op Gallery is located at 3470 Zafarano Drive, Santa Fe, NM 87507. I love the Chai (with almond milk, though they have soy, too, if you prefer) at Tribes Coffee house plus they serve awesome coffees and other drinks, baked goods, and—oh, yes—breakfast is served all day. Their WI-fi has always worked great for me and they’re across from the Regal Cinema. After studying for hours and hours, you can treat yourself to a fresh pastry or some blue corn cheese enchiladas with red or green chile or hit up a first-run movie. The Teahouse located at 821 Canyon Road, Santa Fe, NM 87501. If you’re at the other end of town, consider writing a paper, doing research, or reading at The Teahouse . It’s on Canyon Road and has great food and drinks. 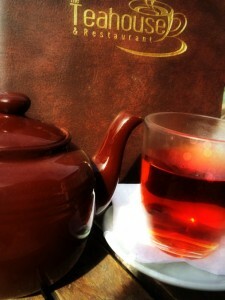 They have teas from China, India, Japan, Sri Lanka, and even Santa Fe, and create their own flavored teas. My favorite drink is the Tokyo Fog made of matcha, vanilla and milk (request soy if you don’t take dairy) or the gorgeous Earl Grey Provence (Provencal lavender and Earl Grey tea). Sit inside or catch some rays on their beautiful patio (did you know New Mexico has nearly 300 sunny days each year?). The Teahouse is a fave Santa Fe, NM hangout among SWC students, classmates ask me to meet them there all the time; if you’re going to read and research for hours, you can always take a break to check out the adjacent galleries and get an infusion of art and energy. When my energy is high so are my grades. Luckily, Santa Fe is an awesome grad school destination with lots of great places to while away the hours and study while making progress toward your dream of entering the helping profession with a degree from Southwestern College.